Continental Marine Captain Matthew Parke, artist unknown, date unknown, FourScore. Continental Navy portraits are difficult to come across. Continental Marine portraits are almost nonexistant. That is what makes this miniature so valuable. 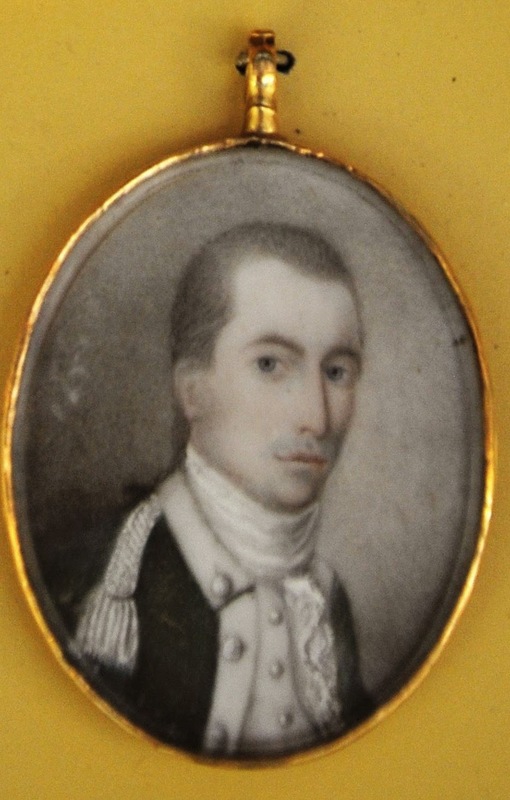 The miniature portrait above is part of a matched set depicting Captain Matthew Parke and his wife. As one of the very first marine officers, Parke served alongside Jones aboard the ship Ranger during its highly successful cruise in British home waters, as well as witnessing the Battle of Flamborough Head from aboard the frigate Alliance. He was later rebuked for insubordination, but is still remembered today by Marines for his courage and place among the founders of the Corps. The same day that the Continental Navy's uniform was detailed by the Marine Committee, the Continental Marines received their uniforms. Green coats with white facings were accompanied by a set of white small clothes and tall leather collar to protect the neck from edged weapons. Parke wears a uniform in line with those regulations. his white collar is buttoned town onto his lapels with large silver buttons, which are spaced evenly. He wears a tall white cravat that peeks out of his single breasted white waistcoat, with its smaller silver buttons. On his visible right shoulder is a silver epaulet.